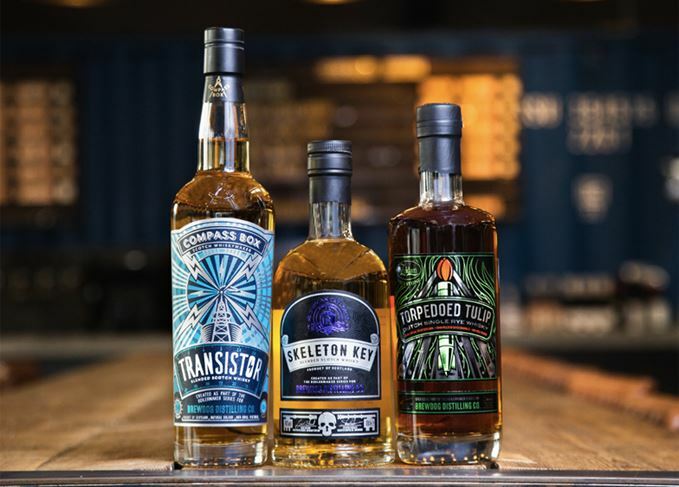 BrewDog has collaborated with whisky makers Compass Box, Duncan Taylor and Zuidam to release a new range of ‘boilermaker’ whiskies designed to pair with its beers. The launch has been timed to coincide with the renaming of the brewery’s LoneWolf distillery as BrewDog distillery, to address the ‘disconnect’ between the two brands. The three whiskies in the new series have been created to bespoke recipes designed to pair with BrewDog’s beers as a boilermaker or hauf and hauf serve. Transistor, a blended Scotch made by Compass Box’s John Glaser, is designed to partner with BrewDog’s flagship beer, Punk IPA. A single malt-led blend, the whisky contains a ‘good proportion’ of grain from Cameronbridge, as well as malts from Linkwood, Teaninich, Dailuaine and Clynelish, with some maturation in French oak. Bottled at 43% abv, it’s described as having ‘pineapple, orange and lychee’ notes, with a sweetness that is cut through by the ‘spiky, tropical, hoppy bitter notes of the beer’. Torpedo Tulip is a 100% rye whisky from Millstone, which is made at the Netherlands’ Zuidam distillery. Matured exclusively in ex-oloroso Sherry casks and bottled at 46% abv, the whisky is described as having notes of ‘rich stone fruit’ and ‘underlying spice’, and has been chosen to pair with BrewDog’s American pale ale, Dead Pony Club. Skeleton Key is a blended Scotch whisky created in collaboration with blender Duncan Taylor to pair with BrewDog’s Jet Black Heart stout or Zombie Cake porter. Containing a proportion of peated Bunnahabhain and a high ration of single malt, including whisky from Glentauchers distillery, Skeleton Key (46% abv) is described as having ‘bold, maritime and peat smoke aromas’ which pair with the chocolate and coffee notes in the beers. All three no-age-statement expressions are available to purchase in all BrewDog bars as well as through its online retail site for £52 for a 70cl bottle. Kersley added that the series has been designed to introduce BrewDog’s existing customers to whisky. ‘What better way to introduce our passionate beer drinkers to amazing whisky than to make that seamless and effortless by communicating through the medium of the beer?’ he said. The brewery recently appointed ex-Johnnie Walker boss David Gates as its managing director of BrewDog Distilling Co., the company’s spirits arm. BrewDog opened its own distillery at its Ellon site in 2016, and following years of barley, yeast, distillation and maturation trials, has now settled on a recipe for its flagship single malt. Now known as BrewDog distillery, the site is set up to produce a number of spirits, including vodka and gin. Kersley said: ‘Our whisky development has kicked into gear since the end of last year. ‘The majority of last year was painstaking in the sense that were trying to develop a new make spirit which we’re really pleased with, but we were also breaking down that whole production process to understand mainly where we can drive flavour, and control flavour. The LoneWolf brand will continue to be used for BrewDog’s gin.